Your Favorite Fabrics Will Dance In This Quilt! 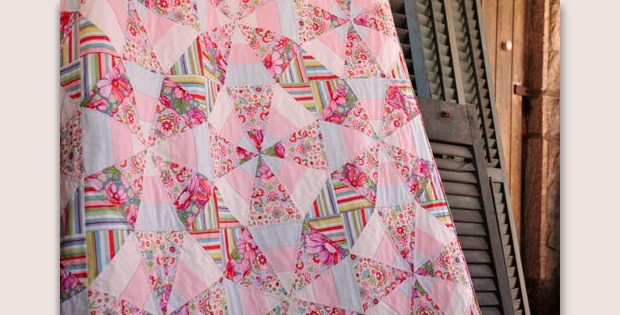 This complex quilt is surprisingly easy to make. Strip piecing and a special ruler, plus striped fabric, make it seem much more difficult than it actually is. The octagonal blocks give the illusion of curves and combine to make circles across the surface of the quilt. We love the soft colors within a limited value range that the designer chose. Make yours as soft or as colorful and exuberant as you like, and in any colorway. It’s sure to be gorgeous. Just mind the values so there’s enough contrast for the circles to stand out from the background. The quilt, by designer Mary McGuire, is 60 1/2″ x 48 1/2″ once completed. She hand quilted hers, but your will be just as lovely however you choose to quilt it. To make this quilt you’ll need a Kaleido Ruler by Marti Mitchell, or any ruler that makes 45 – 67 1/2 – 67 1/2 degree rectangles. You can purchase the Kaleido Ruler here. 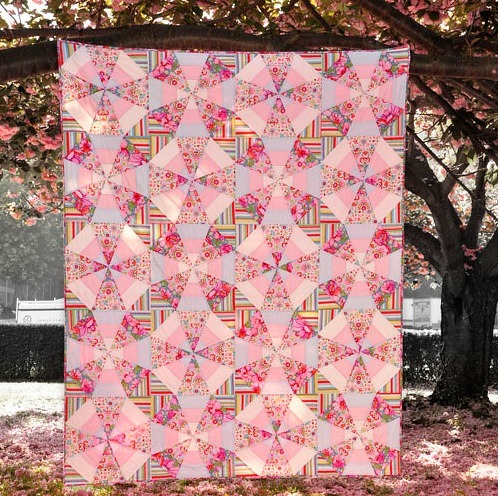 Click here for the free “Whirl” kaleidoscope quilt PDF pattern.